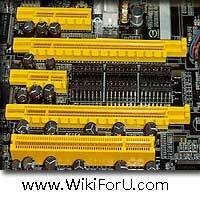 The PCI stands for Peripheral Component Interconnect. It is high performance Bus that is used to integrate chips, processor, memory subsystems and expansion boards. This Bus was designed by Intel in 1992 for integrating chips on a board. Originally, it was 32 bit but now it also support 64 bit transmission. This is most popular Bus that is mostly used for integrating peripherals. Now , a new version of PCI, known as PCI Mini also developed by notebook manufacturers, so that they can reduce the manufacturing costs for notebooks. You May Also Like: What is A Bus in Computer Organization? PCI bus provides a bus architecture that also supports peripherals and devices like Hard Disk Drives, Networks etc. PCI successfully replaced all other older buses like ISA, EISA and VL . PCI has various features. It is the only bus that can carry 64 bits of data in each clock cycle which makes it useful for Pentium processor family. Synchronous Bus Architecture: PCI is a synchronous Bus . All data transfers in PCI bus takes place according to a system clock. The first PCI which was launched by Intel , supports 33 Mhz maximum clock rate while the newer PCI Buses now supports maximum clock frequency of 66 MHz. Linear Burst Mode Data Transfer: PCI supports the feature of 'Burst Data Transfer'. With Burst Data Transfer, the data can be transferred at very high speeds. In Burst Data Transfer, a single address cycle can be followed by multiple data cycles. Thus , in Burst Data Transfer, Data is read and written to a single address location, which goes on automatically increment. In short, the data will be present on the bus, on each clock cycle. With this, we can achieve very high data transfer speeds that is 266 MB/sec for 32 bit data. With each clock cycle, a new data will be placed on the bus. If the cycle frame signal is active only for one data cycle, an ordinary transfer takes place. But if it is active for multiple clock cycles then the Burst Data Transfer takes place. Large Bandwidth: PCI bus has much larger bandwidth than its previous buses (ISA, EISA and MCA). It can handle both 32 bit as well as 64 bit data. For 32 bit data, the maximum bandwidth will be 132 MB/sec which becomes more when Burst Data Transfer mode is used . It comes out to 364 MB/sec when Burst Data Transfer is used. Thus the bandwidth of PCI bus is very larger.